Great news! 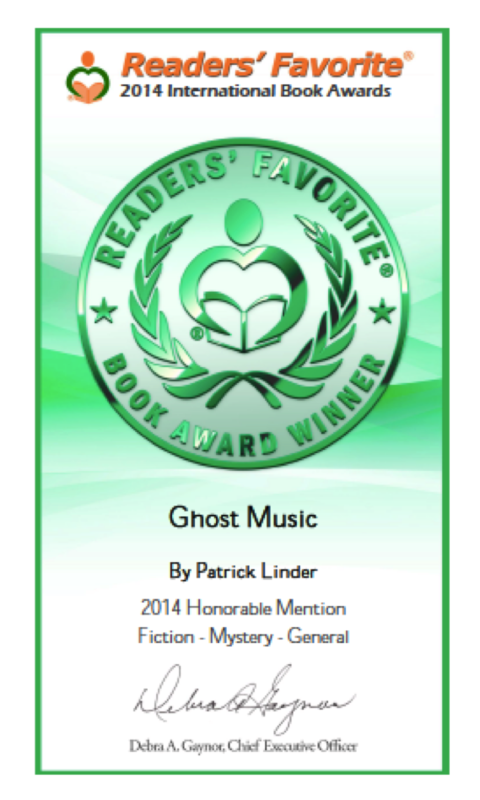 I’m pleased to announce that Ghost Music has been recognized as a winner in the 2014 Readers’ Favorite Book Awards. Ghost Music, the first novel in the Marcus Brace detective series, took home a 4th-place, honorable mention finish in the Best Mystery category. This year saw a record number of entries and I’m honored that my novel was among the winners. Among other great benefits, Ghost Music now has an official listing on BookAwards.com, my book will be listed in an October 1 Readers’ Favorite press release, and I have been invited to their annual awards ceremony in Miami. My publisher can also now add the new awards seal pictured above to the cover of my book. This 2014 Honorable Mention finish is in addition to the official seals that Readers’ Favorite had previously awarded me for receiving multiple 5-star professional reviews. While still in unpublished manuscript form, Ghost Music also received a 3rd-place award from the Public Safety Writer’s Association, which specializes in stories about crime and/or detectives. All of this is to say that I am thrilled with the critical attention my book has received from multiple sources. But I still need your help. Probably more than ever. You can help in two important ways: 1) Please help spread the word about my book. If you have friends who like mysteries or are looking for a new book, I’d love it if you would recommend my book. 2) If you haven’t already, please leave a review of Ghost Music on Amazon and Goodreads. Reviews are a fantastic help for an author and are more useful than you might know in generating interest for an author’s work. So, please spread the word and leave a review for me. As always, feel free to contact me directly (email listed below) with questions about the book, what I’m working on next, or queries about how I can help if you would like to use Ghost Music as a book club selection—I have a package of materials available for book clubs and am available to answer questions either via email or—if you are in the Seattle area—in person at a book club meeting.